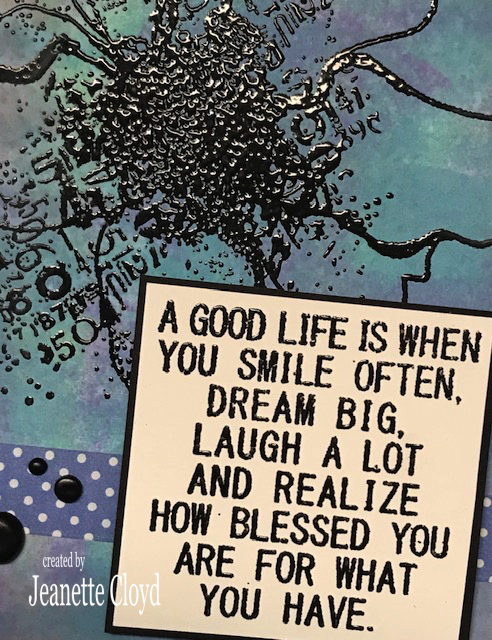 On December 3rd of 2018 I had a blog post that featured the a card I'd made with the stamp set I won as a Growing in Unity gal. 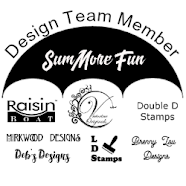 The stamp set - A Good Life - is not my typical kind of stamp set, which is the reason I chose to receive it. I wanted something that was going to make me think outside the box. 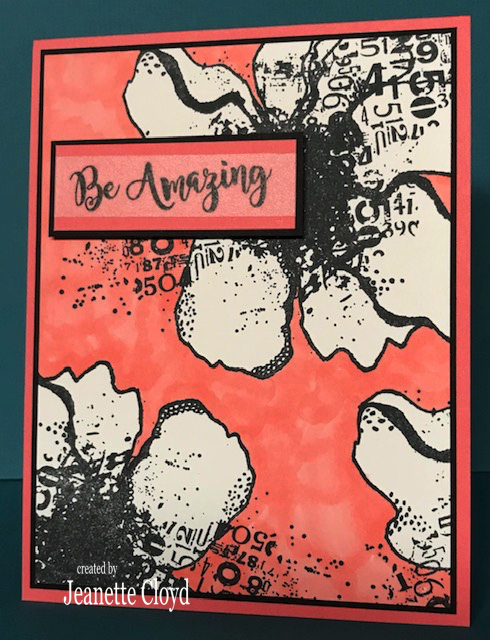 My card on that blog post incorporated a new technique for me, something I'd seen that I wanted to try. 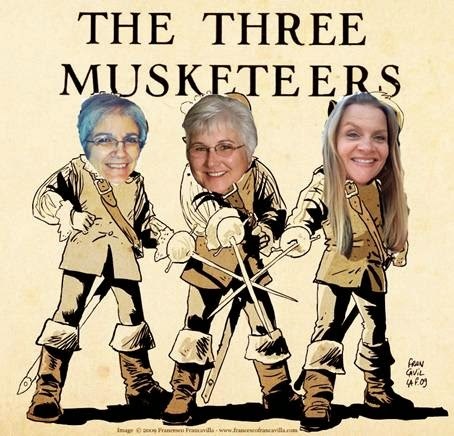 You can see my December 3rd blog post HERE. I decided at that time that I was going to use the A Good Life stamp set to make seven different cards - different techniques, etc. 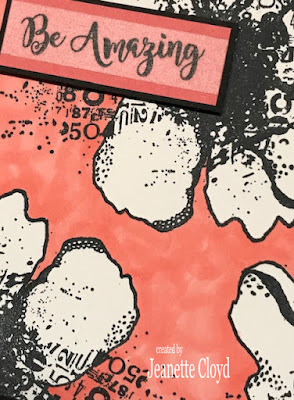 Today's blog post has cards #2 and #3 from this stamp set. For this card I pulled out my brayer - GASP! It never ever gets used - and four different colors of Ranger Distress Oxide inks. I used the brayer to randomly roll three of the colors onto a piece of 110# White cardstock. Of course I cleaned the brayer between each color and I let each color dry a bit before adding the next color. I then took a sponge and sponged the edge of the piece with the fourth color. I then sprayed some water onto the piece, hoping to get the ink to make some water spots. However, the look is so very subtle that it really doesn't show. After it had thoroughly dried, I stamped the flower onto the piece with Versamark ink and heat embossed it with SU black embossing powder. 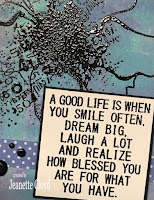 The quote was also stamped/embossed on 110# White cardstock. This technique really was a lot of fun. I guess I might like thinking outside the box, at least sometimes. 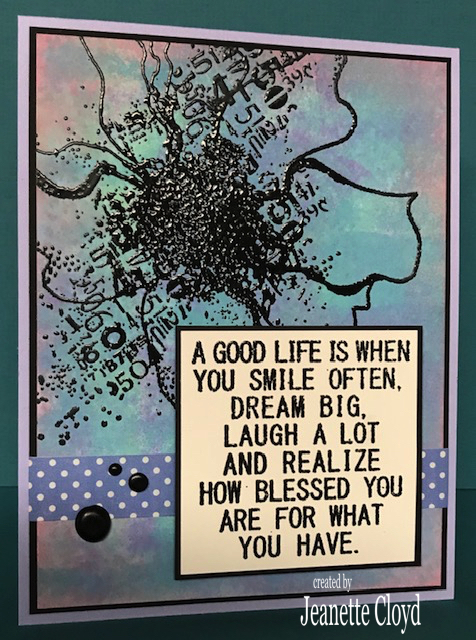 I started with a piece of 110# White CS for this card randomly stamped the flower image in three different areas. I then used a single Copic marker to color around the flowers - I call this resist coloring, but I'm not sure that's the correct term. 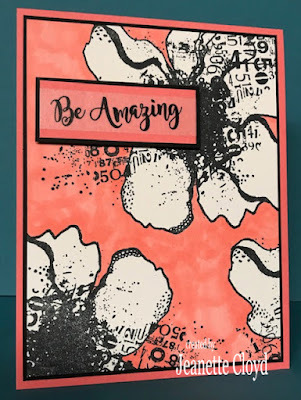 I wanted a smaller sentiment for this card, but couldn't convince myself that this challenge I've taken on allows me to use any stamps from other sets for these seven cards, so I did what any crafter would do, I looked for alternate options, in this case I looked in my Washi Tape stash. LOL! 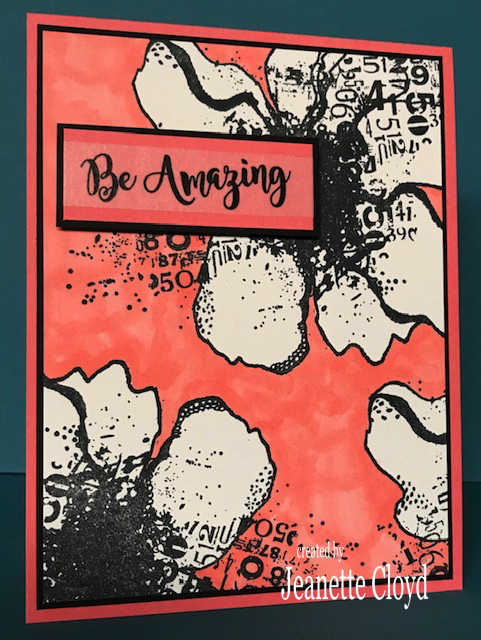 The "Be Amazing" is really a piece of Washi Tape that I added to a piece of Cameo Coral CS and then matted with black. It works for me. 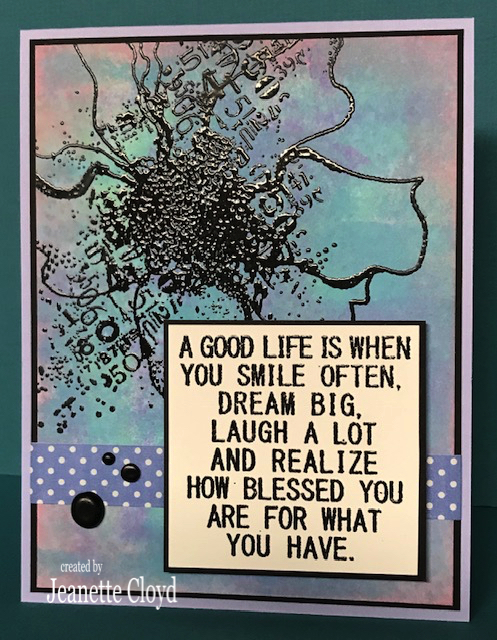 I hope you've enjoyed seeing the three different cards I've made so far with the A Good Life stamp set. I'll be making four more (for a total of seven) before this month is over. 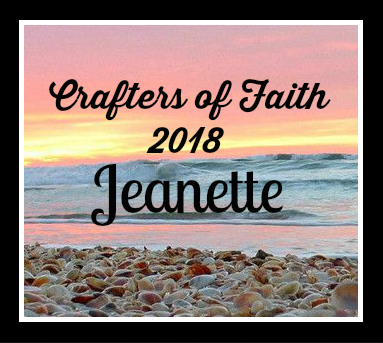 I love these awesome beauties, Jeanette!! Amazing work! 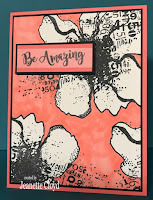 I like the blend of colors you got on card#2, and the black heat embossing looks beautiful! With card #3 I like that you stamped the flower on the sides and only parts of it are visible. Very cool effect coloring the background instead of the flower. Nicely done! 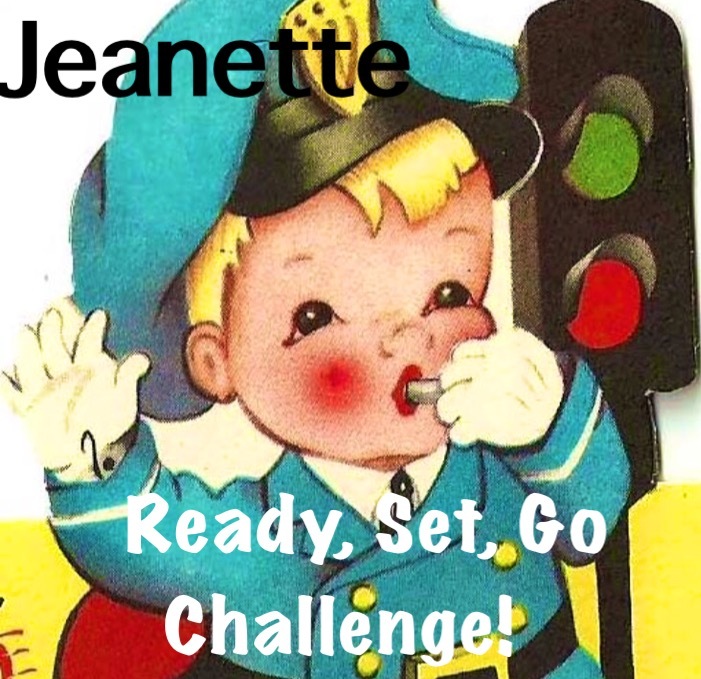 Missed this post Jeanette - I love the blue toned card - that background is gorgeous!